Taken from Knitscene Magazine - '11 Winter: "This gauzy take on the Bermondsey shows how drape and weight affect a silhouette." 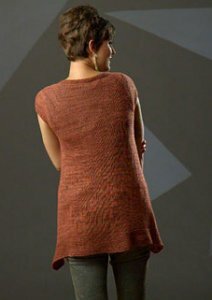 This pattern is in Knitscene Magazine - '11 Winter, page 74. Size US 7-24" circs, US 7-40" circs, US 7 DPNs (or sizes needed to obtain gauge) and stitch holders are required but not included. Finished Bust Circumference: 27 (29.5, 33, 36, 39.5, 42, 45, 48.5)". Color Shown is #158 Cognac. $17.60 -- Kit price including yarn only (no book or pattern). $26.40 -- Kit price including yarn only (no book or pattern). $35.20 -- Kit price including yarn only (no book or pattern).